It's a familiar enough scenario in Irish public life, that chasm between the man who's convinced he's doing a great job, and the people looking at him convinced that he's an eejit. In politics, it is a daily occurrence. In the case of the chief executive officer of the Football Association of Ireland, there are an awful lot of people who think he's an eejit. Obviously he doesn't agree. John Delaney is apparently convinced that he's doing a wonderful job. Otherwise he wouldn't be paying himself €360,000 a year, which makes him one of the highest paid CEOs of any football association in Europe. Undeterred by this financial endorsement of his prowess, one online petition calling for his resignation was this weekend heading for 15,000 signatories. Many more thousands across social media were also venting their scorn at him - again. And of course in every pub and office and factory floor where Martin O'Neill's abdication last week was being discussed, we would venture that no conversation ended without Delaney getting a few further blasts of invective. Add it all together and he is reaching levels of toxicity last reserved for the likes of Bertie Ahern, Brian Cowen and various bankers such as Seán Fitzpatrick, Michael Fingleton and David Drumm. In Delaney's case it is partly to do with the scale of his profile and the longevity of his career as CEO. He has been in the job for 13 and a half years. This has given people a lot of time to get a good look at him. And for a lot of that time, they have seen far too much of him. Serious administrators in sport generally keep their heads down. An AGM and a couple of press conferences per year are usually about the height of it. Philip Browne of the IRFU lives by this rule; Páraic Duffy, ten years director general of the GAA until he retired in March, did likewise. Neither of them wanted the publicity nor needed the ego trip. In 2006, GAA turnover at central level was about €30 million; by 2017 it had jumped to €65.6m. In 2007 IRFU turnover was €48m; by 2017 it was €85m. In 2007 FAI turnover was €45m; by 2017 it was €49m. In other words, the IRFU and GAA have raced ahead of the FAI in terms of financial performance over the last decade. And yet the CEO of the worst-performing organisation is paying himself by far the most money. And this is before his catastrophic handling of the Aviva Stadium financing project is considered. In any large business with a robust culture of accountability, an act of mismanagement on this scale would have been a sackable offence. It is estimated that a project, which initially was supposed to cost around €80 million, will cost €150m by the time all debts and charges and interest are paid off. 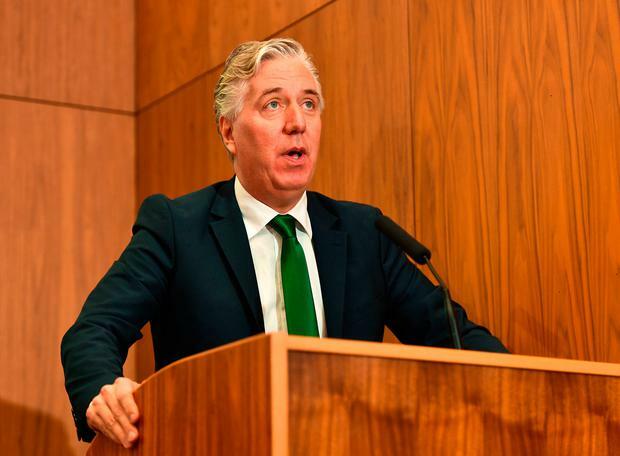 The FAI's share of the Aviva debt was supposed to be self-financing, mainly through the sale of 10,000 ten-year tickets - the famous Vantage Club scheme launched with much fanfare by the CEO in September 2008. With prices for these tickets ranging from €12,000 to €32,000, and the economy by now in meltdown, it was a delusionally inflated offering. The take-up was derisory. Last year Delaney finally admitted some culpability: "I think the pricing was certainly too high on the bigger ten-year tickets." In terms of project management on this scale, Delaney was proven conclusively to be out of his depth. Naturally enough, everyone else was made pay the price. The upshot is that the game in this country at every level has been starved of cash in terms of facilities, coaching and personnel because of the crippling stadium debt, which will hang over the organisation for years to come too. Last January it emerged that O'Neill had been approached to take over as manager at Stoke City. He had yet to sign his new contract with the FAI. A few weeks later he did sign up, but now his salary had been doubled to around €2m. It was an English journalist, known to have close contacts with O'Neill, who broke the Stoke City story. One wonders if Delaney had been played by O'Neill, outmanoeuvred in a trumped-up auction for his signature. Why did the Ireland manager's salary double, at a time when the FAI didn't have the proverbial pot to piss in? Was Delaney bounced into offering this ludicrous sum by a wily old fox who wasn't shy about advertising that he was in demand elsewhere? Ten months later, after a pitiful year of performances, and with plummeting public interest, an apparently panic-stricken CEO had to reach for his cheque book again, this time to pay off O'Neill and his crew to the tune of another €1.5m at least. Again, there seems to be a delusional quality to this kind of dealing - the last of the big spenders, flashing the cash when the bank account is bare. And all along over the last 13 years, Delaney has never given anything but the impression that he is delighted with himself, and the job he is doing. Sure wasn't he carried shoulder-high by the fans in Poland at Euro 2012, at the cost of his shoes, and possibly his socks too? And doesn't his girlfriend Emma love him, and doesn't he love Emma too, and so what if they wanted to tell the world about it? Oh, and not forgetting the night in that Dublin pub in 2014 when he was filmed singing a provo song to an appreciative audience. And then hired a London law firm to say it was not him in the video, and would take legal action if anyone said it was him; and then changed his mind and said that it was, in fact, him. As that nippy inside forward Bono is wont to ask, how long, how long must we sing this song?